Battambang, Cambodia travel highlights. Photo essay features the Bamboo Train, Buddhist temples, villages and a Buddhist wedding blessing ceremony. More reading: Read more about our visit to Battambang and our day on a motorbike around Battambang, Cambodia. 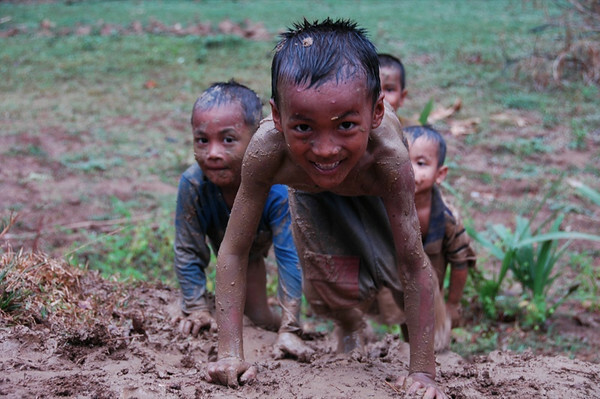 During our dry season tour of the Battambang countryside on motorbikes, a miracle happened - it rained! The dry and muted landscape became electric, giant puddles of water formed everywhere and the kids went nuts. These kids were really having a great time sliding up and down this muddy hill. Read more about our day on a motorbike around Battambang, Cambodia. The monks finish their chants and descend to pick up their containers of food and return back to the temple. Money is also given to them for the blessing, but we were told this gets used for the upkeep of the temple and not for their personal profit. Read more about our visit to Battambang, Cambodia. 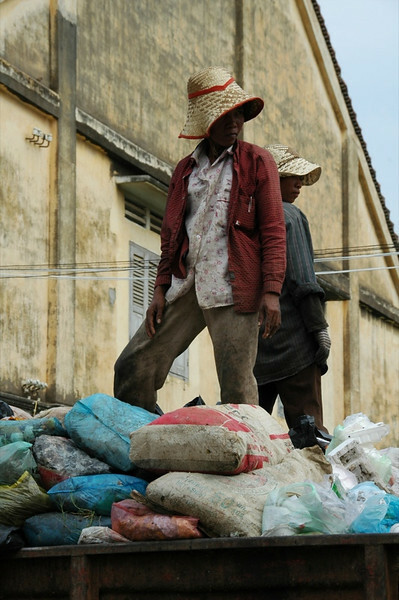 Unfortunately, poverty is a visible reality throughout Cambodia and scavenging remains a way of life for some. Read more about our visit to Battambang, Cambodia. 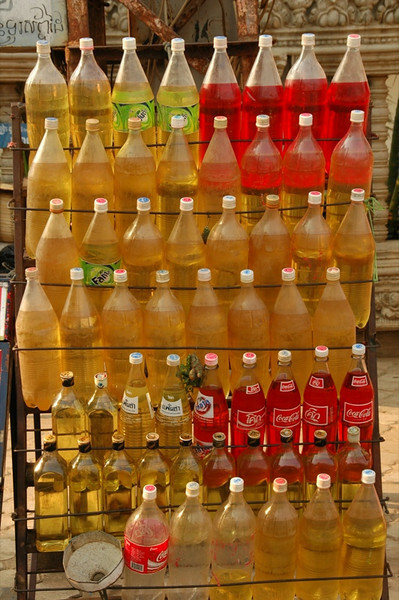 Throughout Cambodia petrol is sold in small quantities in reused soda and liquor bottles. Apparently, it's the ideal size for motorbikes...and people's pocketbooks. 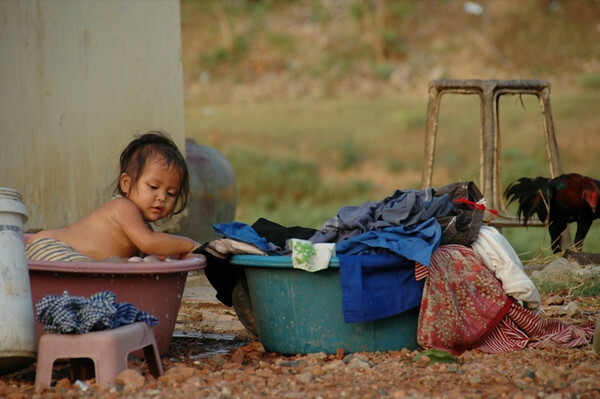 Read more about our visit to Battambang, Cambodia. 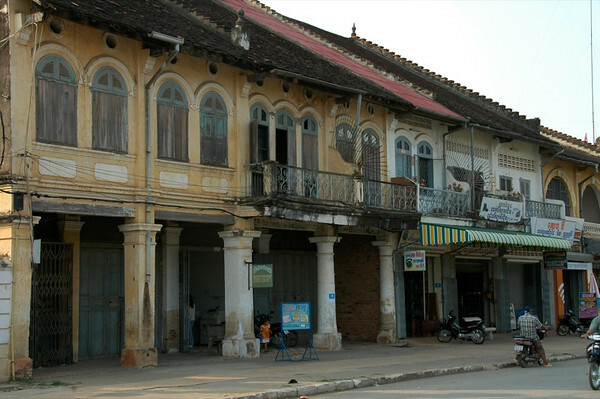 French colonial influence is still clearly evident in much of Battambang's architecture, featuring rows of low rise buildings with shuttered windows and wrought iron balconies. Read more about our visit to Battambang, Cambodia. Late afternoon flash rainstorms turn a dry and muted landscape electric. 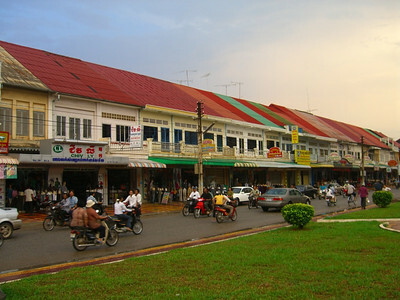 Here, in downtown Battambang, the surprisingly deep greens contrast nicely with the multi-colored corrugated rooftops. 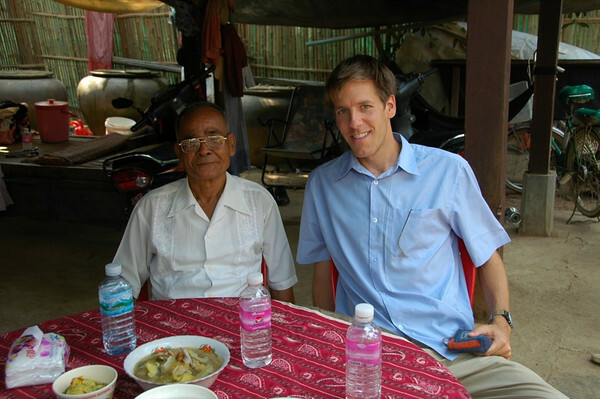 Read more about our visit to Battambang, Cambodia. 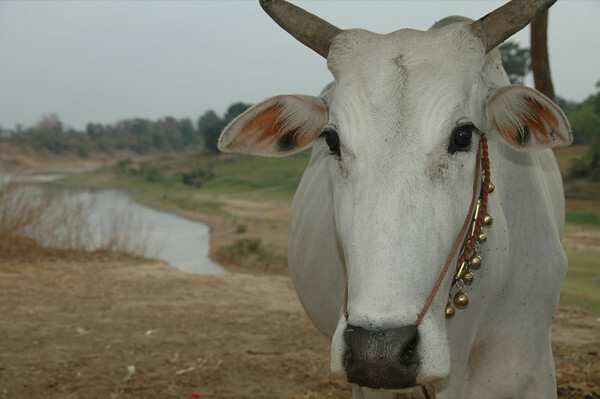 A riverside pause during our motorbike day outside Battambang afforded us a visit with this lovely bovine specimen. Read more about our day on a motorbike around Battambang, Cambodia. 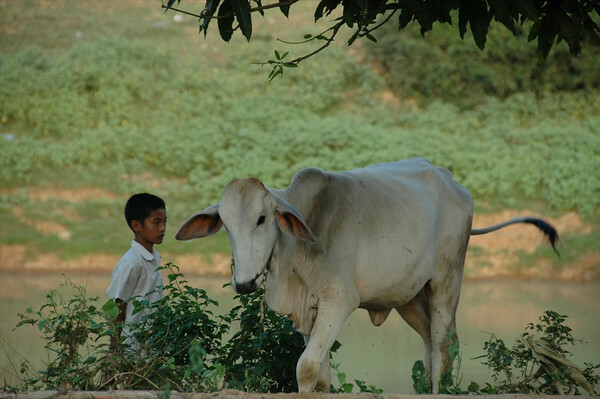 This boy tends his herd under the bridge just across the road from the bustle of Battambang's central park. Read more about our visit to Battambang, Cambodia. The start of a new friendship. Dan struck up a conversation with some Cambodians having a late afternoon snack of bugs and sugar cane juice. Next thing we knew, Dan was being taught how to properly dismantle them by removing their wings and legs. After that, there's nothing left to do but pop them in your mouth and chase them with a healthy gulp of sugar cane juice. The large brown palmetto bugs (not shown...but we could) were crunchy, virtually meatless, and felt like eating a bag of anise-soaked shrimp shells. 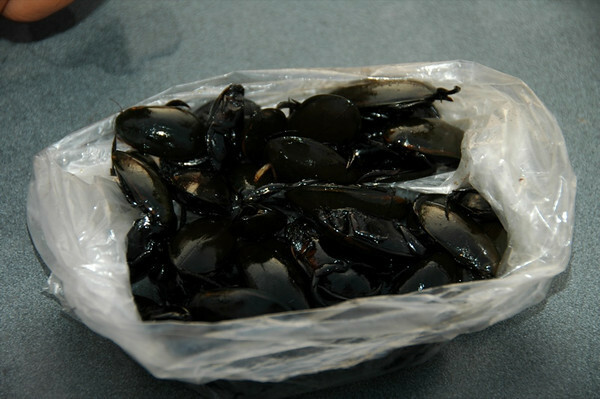 The black bugs, called roaches by the Cambodians, were in fact a bit meatier and tastier. Dan favored the black beetles. The Cambodians had a good laugh. Having apparently earned some street credibilty, we were invited by our Cambodian friends k to their house in the village. They wanted us to meet their relatives visiting from California (many Cambodians emigrated to the US in 1979-1980) and their Cambodian cousin who had just gotten married. The groom invited us to the blessing ceremony the next morning. 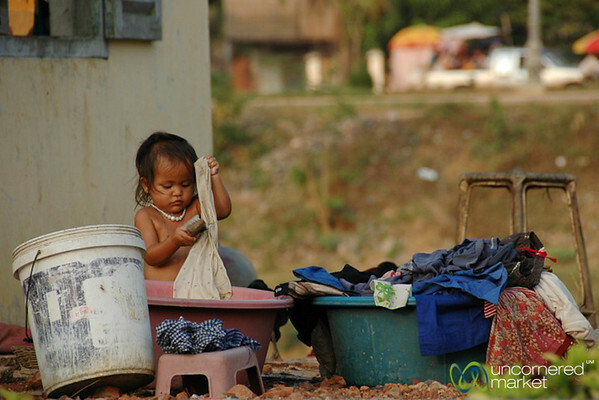 Read more about our visit to Battambang, Cambodia. 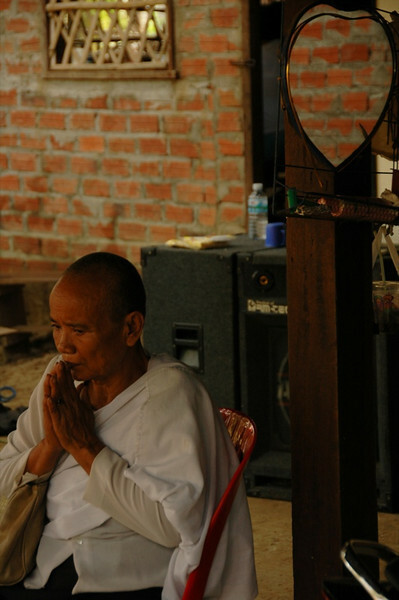 As the monks led prayers and chants (broadcast throughout the village with a hefty sound system), the older folks prayed downstairs in the open air. This lasted 2-3 hours before everyone was invited to eat and sing karaoke. Read more about our visit to Battambang, Cambodia. Scrub the clothes with soap. Read more about our visit to Battambang, Cambodia. The happy bride and groom. 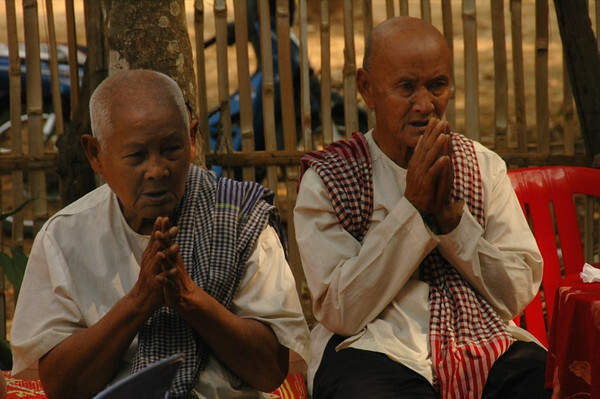 The actual wedding had taken place two days before, but the blessing ceremony is required to make the union complete. The groom is a tuk tuk driver in Siem Reap and saved for two years to pay for this wedding. Several different people told us that a wedding normally costs around $2,000. When you are only earning a couple of dollars a day, that's a hefty expense. The groom (or his family) normally pays for the wedding. Read more about our visit to Battambang, Cambodia. Get in the tub. Read more about our visit to Battambang, Cambodia. The stairs leading up to the monks' prayer room were steep, its wooden floor hard, and its air heavy. The older members of the community decided to spend the ceremony downstairs where it was more comfortable. Here, their attention never strayed. 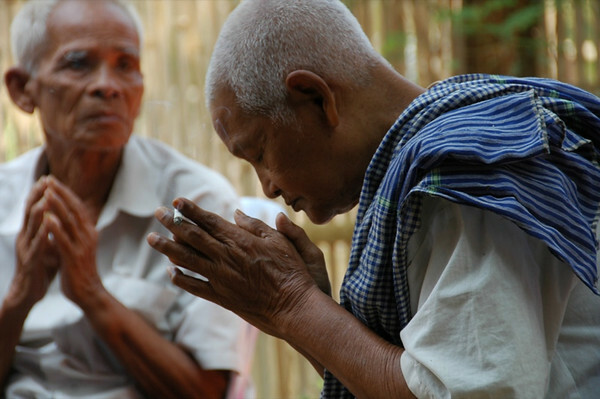 Read more about our visit to Battambang, Cambodia. The blessing ceremony prayers and chanting went on for hours. This older man gets his nicotine fix mid-prayer. Read more about our visit to Battambang, Cambodia. The older man on the left was part of the bug feast the day before. He took a liking to Dan, always smiling at him and patting him on the back and making sure Dan was always by his side. Read more about our visit to Battambang, Cambodia. 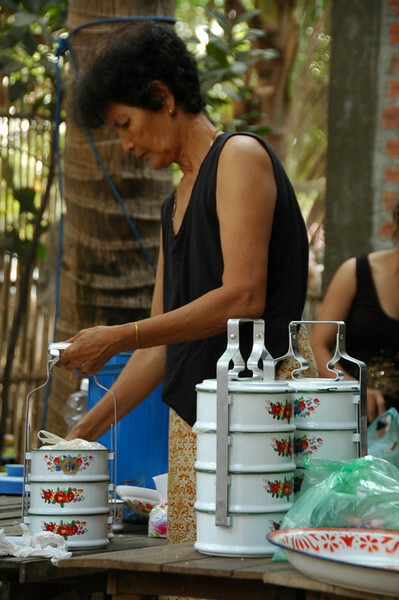 When the four monks arrived, they handed these empty metal containers to the women. At the end of the ceremony, in a sort of exchange for the blessing, the women of the family filled each layer with a different type of food - soup, fish, chicken, noodle salad. It was quite a feast. Read more about our visit to Battambang, Cambodia. The daughter of one of the groom's cousins. 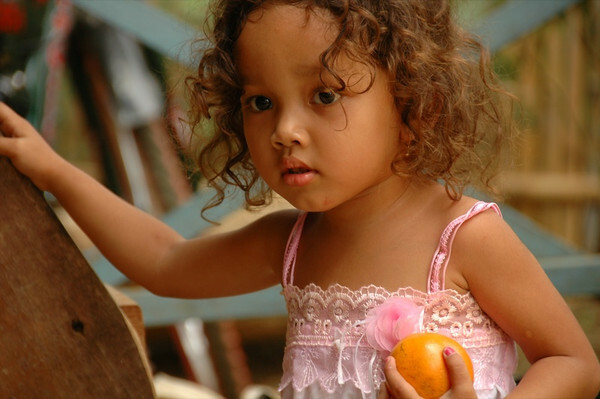 She was a little princess, but shy - always at her mother's heels. Read more about our visit to Battambang, Cambodia. As the monks finished their blessings, bowls and piles of food were quick to the table. On the right is Seaq Bo, the one who taught Dan how to properly eat a bug. On the left is his uncle, who absolutely adored Dan. The woman to Audrey's right translated for him, saying "My grandfather wants me to tell you that he really likes you. He thinks of you as a son." By the way, the food was fantastic. Our favorite was the grilled fish with bits of green mango and ripened mango salsa - tangy, spicy and refreshing. Sour soups and curry completed the table. As is custom, we ate until we were stuffed. We made some room for the finishing touch - mango and sticky rice treats. Read more about our visit to Battambang, Cambodia. 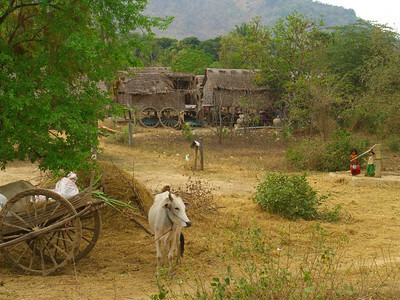 Typical village scene outside of Battambang. Read more about our visit to Battambang, Cambodia.